(Newser) – The weird story of Rand Paul and the neighbor who attacked him continues: The senator filed a civil suit against neighbor Rene Boucher last week, and on Wednesday Boucher responded by filing a counter-suit against Paul, WBKO reports. Paul's lawsuit claims he was "deprived of his enjoyment of life" and is at increased risk of injury or disease; it seeks compensatory and punitive damages for "physical pain and mental suffering." (He suffered six broken ribs when Boucher tackled him from behind due to an apparent beef over Paul stacking brush in a pile near Boucher's property.) Boucher's counter-suit seeks to have Paul's suit dismissed, but that's not all. The grown up thing to do here would have been to pay neighborhood kids $20 to throw eggs at his house. That way no one gets in trouble and you get your point across. Every Monday at 330pm school kids would RUIN his house with a carton of eggs and go to the neighbor for their dough. For a few hundred dollars he would have had the last laugh. Pain and suffering? Broken ribs are EXTREMELY painful, and take weeks to go away. Have to lay on your back and cannot roll over or move the wrong way. 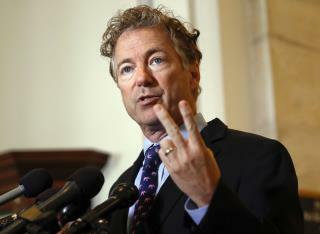 Rand, I am of independent mind just like you and admire your modus operandi. But let it go. You already have to deal with the hostility in Washington.You are above that.